In August 1996 we made another trip to my former hometown Tyssa . Spending the night in Bahratal should be followed by a visit to my hometown, its surroundings and the walls of the Tyssa . I had planned to make a detour to Raiza and Schneeberg on this trip , since I have not seen both places since 1944. Coming from Peterswald over the district of Brache , our way led past the school to Raiza , where we were pleasantly surprised by the good condition of the restaurant “Waldbaude” I used to go to often with my parents. The place itself continues to dream his “Sleeping Beauty”. 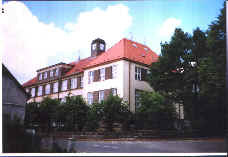 Once back in Tyssa , I originally wanted to visit the “Kleine Wand” first and therefore parked our car at the back of the school next to the “Rotsch Heger” house. In the backyard of the school I saw construction workers who were probably carrying out repair work in the current school holidays. I immediately thought that I should use the favor of the hour to possibly obtain a “school visit”. Although I do not speak Czech, I found a hearing and agreement with the school’s friendly caretaker. With “hands and feet” I submitted my request and explained to him that I had attended the school from 1934 to 1942 and I would be very happy to be able to visit them again. He took a large bunch of keys out of his room and began a tour of the entire school building. Starting from the lower floor, where the large gymnasium and the handicraft rooms as well as the Teaching kitchen, then up to the first floor. He unlocked all the rooms and I was convinced of the good condition. New flooring was laid out in the classrooms. They have been redesigned into specialist cabinets and equipped with modern facilities. Even two pianos are ready for the music lessons, about which our former teacher, Mr. Salamon, who could accompany us only with his violin, would certainly have been very happy. I was thrilled when I could see in the corridors the still completely preserved and in some cases enlarged display showcases, where even the groomed and prepared game trophies provided by my grandfather and father exist. The wardrobes on the front side of the corridors are just as preserved and the sanitary facilities are modernized. On the second floor was also busy in the classrooms renovated and I was amazed about the construction of the gym. Here one was building up another floor on the original flat roof of this hall to create more space. Now the tour continued to the top floor, where in my time was the room for the 8th grade. From there, a magnificent view over the whole of Tyssa far over the country offered. Since I had never returned to the Ziegelteich , our beloved Waldsee, after 1944 and had heard that he was allegedly in the military restricted area, I asked the helpful caretaker for information. Now came the “coronation”. He brought from the next room, where we had laid out diligently collected medicinal herbs to dry during the war years, an old military scissors telescope, which he brought in the direction Ziegelteich in position. Looking around, he gave me to understand that the brick pond no longer in the military restricted area and I could visit him. At the end of this tour I thanked the very helpful caretaker of the school. One can imagine that for me this “school visit” after 54 years was as exciting as the one to my “school enrollment”. But now I wanted to pay a visit to the brick pond . Past the “Mühlteich”, which was now expanded as a small bathhouse, the trip went to the district “Am Hofe” , where I parked the car and cheerfully took the well-known trail across the fields to the brick pond . Unfortunately I was disappointed with the sight of getting near our former popular forest pool. It was no longer the steel high tower that greeted us from afar, which we were otherwise enjoying with springboards and water slides. Except the dam no longer reminded of the former sports and entertainment place. The only bathers swam a few ducks in the half-empty run, Bewitched waters. This sight was depressing for me. The further exploration tour to the Tyssaer walls, with stop in the tourist building and further to the high snow mountain closed off the eventful day in my old homeland. However, the highlight of the day was my “school visit”.